After enjoying superb snow conditions in Crested Butte last week, the atmosphere has gone on holiday here on the Front Range. I complained to my mom on the phone that it has been warm and sunny and windy. She laughed because she finds my obsession with snow amusing. 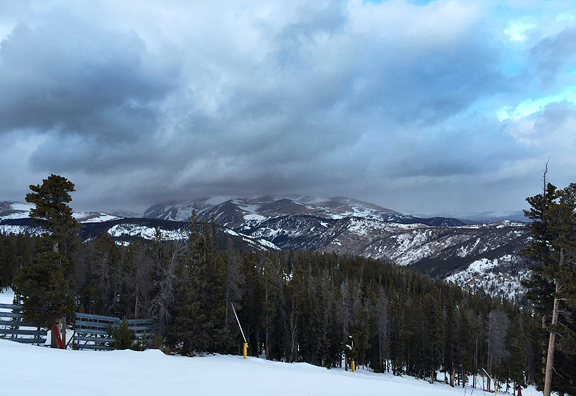 Even though there hasn’t been any new snow this week, I haven’t allowed myself to fall into the snob trap – where you tell yourself that it isn’t worth getting out unless conditions are perfect. No, I’m getting out every day for the fresh air, the exercise, the scenery, the joy of gliding over snow. Keeping active is important to me or else I start to feel down and get the blahs. It also allows me to indulge around the holidays without feeling debauched. I mean, the end of the year is when all of the yummy morsels get marched out at the parties! Among my favorite little foods are meatballs. I pretty much love them all, but I have a soft spot in my heart for these Chinese-style pork meatballs because my mom makes them and they’re delicious. 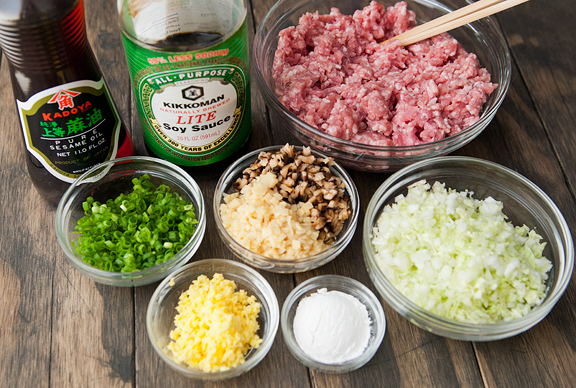 Actually, Mom makes a simpler version with just ground pork and chopped green onions, a dash of soy sauce and sesame oil, and some cornstarch. She’d scoop little spoonfuls of the filling into hot oil and serve them up to my nephew, who ate them with gusto. My version is essentially my Chinese dumpling/potsticker filling because I can’t bear to leave out all of those wonderful vegetables. If you want to make this gluten-free, substitute tamari or a gluten-free soy sauce for the soy sauce. I coat mine in cornstarch before frying because if I don’t, the meatballs tend to lose some of their mass to the oil… and that makes for sad pandas all around. The meatballs are easy to make, but the preparation of the ingredients – mainly chopping the vegetables – can be time-consuming. A word of advice: don’t use a food processor to chop the ingredients because the results are not uniform. Also, when you fry the meatballs, don’t crowd too many of them in the pan. The splatter factor increases and the meatballs will be more inclined to stick to one another. I fried mine in three batches in a medium saucepan. 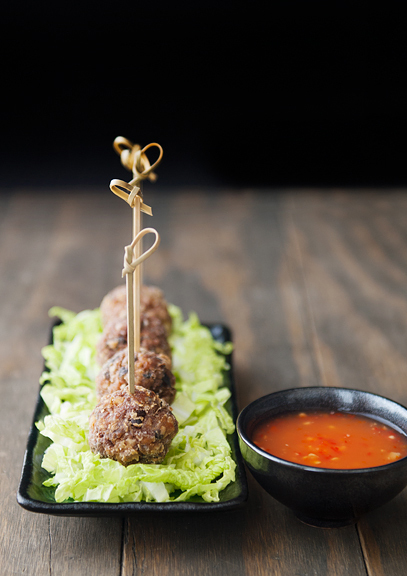 They are best served warm or hot with a dipping sauce on the side. I have tried a soy garlic reduction (that was a fail), a soy sauce-vinegar combination (decent), and chili-garlic sauce (decent). In my opinion, the best accompaniment to the meatballs is Thai sweet chili sauce. 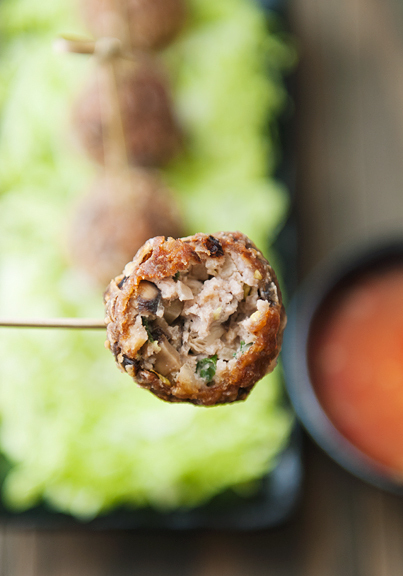 It has sweet, sour, and just enough heat to play off the meatball flavors of ginger, pork, green onions, and mushrooms. 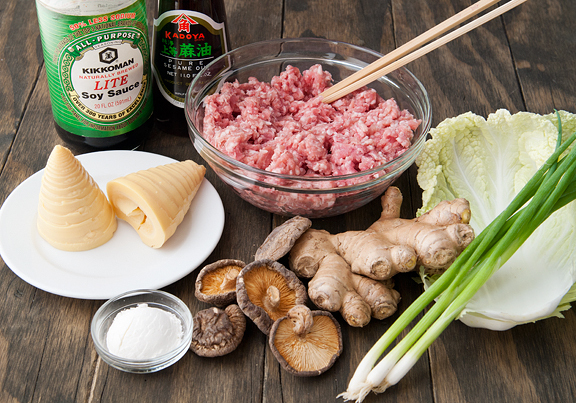 These make great party appetizers or can be served over steamed rice (with the sauce) or in an Asian noodle soup. If you want to make them ahead, just revitalize the meatballs in a moderate oven for 5-6 minutes. 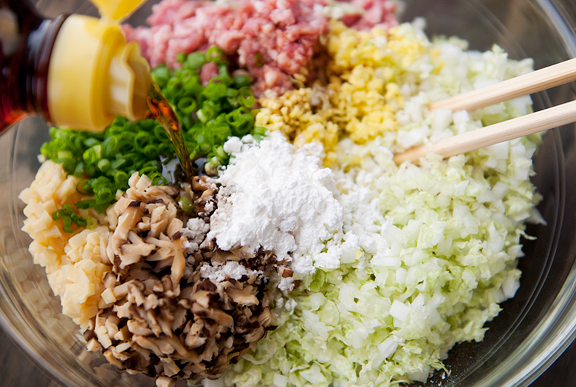 Mix the pork, cabbage, green onions, bamboo shoots, mushrooms, ginger, 1 tablespoon of cornstarch, salt, sesame oil, and soy sauce (or tamari if you want it gluten-free) together in a large bowl until thoroughly combined. Place the 1/3 cup of cornstarch in a shallow bowl. Heat 2 inches of vegetable oil in a medium saucepan or a large pot to 375°F. 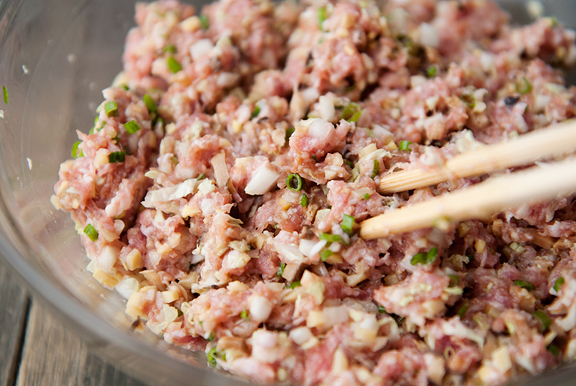 Begin pinching off heaping tablespoons of the pork mixture and forming into balls about 1 1/4 inches in diameter. 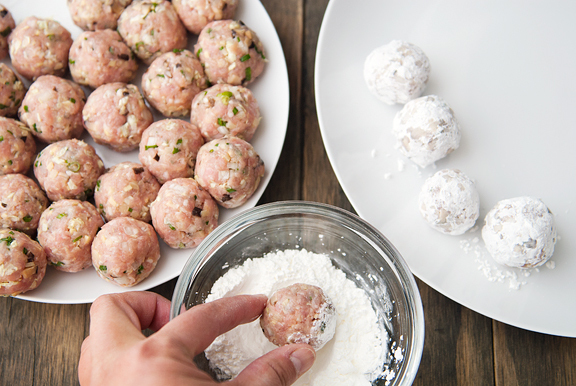 Roll each meatball in the cornstarch to completely coat the surface. Carefully lower the meatballs into the hot oil and fry for 5 minutes. Don’t crowd them. I did mine in 3 batches. Remove the meatballs to a paper towel-lined plate to drain. 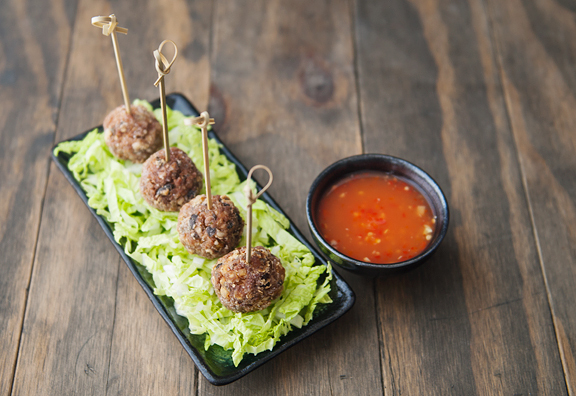 Serve with Thai sweet chili sauce or another sauce of your preference while the meatballs are hot. Makes approximately 30 meatballs. Yum!! 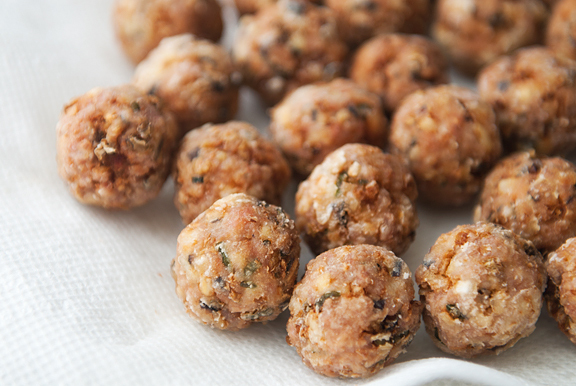 I love meatballs – these look delicious! Mmmm, meatballs… Thanks for your thoughts on the dipping sauces as well! My mom always made up her own sauces from random ingredients, including Arby’s Horsey sauce! Ha ha! I am sure Benjamin will love your version of the meatballs. They look yummy. Hooray for meatballs! I would be so happy to see a bug platter of these at a holiday party. :) Or on my dinner table! Thanks for reminding me how delicious meatballs are, this is totally a recipe I need to make! Are those cone like things bamboo shoots? Wild! I make something very similar. Only difference is my recipe has a splash of sake and a bit of minced garlic. Yum! Yum Yum. Your photos are always so beautifully arranged. The detailing is impeccable. Also, I did not know that it how bamboo shoots look! I’m embarrassed to say I’ve only seen them out of a can. Kind of like brussels…who would have known they grow like that? Oh my! These look absolutely wonderful. I love your photos! Thank you for sharing! Eva – I love Arby’s Horsey sauce. I love anything with horseradish! Eileen – right?! Really good stuff. Annie – yes, those are whole bamboo shoots. You can find those canned and sometimes fresh in Asian markets. katzcradul – ooh, sounds nice! jill – it’s only in the past decade that I started to see fresh bamboo shoots rather than sliced from a can. They’re awesome if you can find them fresh. My grandmother used to make something similar to these meatballs. She’d fry them and then simmer it with sui choy and wood ear in a homey dish. Love this! Thanks for the great recipe and pictures Jen!